If the file is not password protected, you will need to password protect your file by turning on the Password Protect <Document> checkbox. You will also need to ensure that the user you are logged in as has a password (a blank password is not allowed). If your username does not have a password, set up a password first. To do that, double-click your username (Admin if you have only just enabled password protection) and set a password. Choose Connect using Local Network Browser and select the Datacentre from the list of available Datacentres (normally there will just be one). If the Datacentre is running in ASP Mode, you will need to enter the Datacente User (Target directory) and Password. Click the Log In button and the file (and any custom plug-ins) will upload. 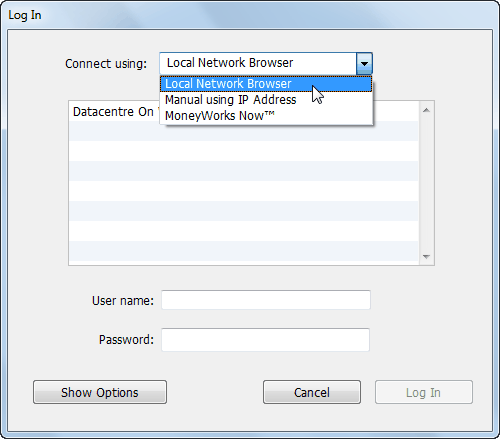 Choose Connect using Manual using IP Address and enter the IP address of domain name of the server. If there is a security certificate on the remote Datacentre, turn on the SSL option. Choose Connect using MoneyWorks Now and enter your MoneyWorks Now login credentials. A Log In window will be displayed showing you the list of folders that you own (you can only upload to a folder that you own). Choose the folder and click Log In. The file will upload. Note: Before uploading a file to MoneyWorks Now, you should ensure that you have a sensible company name in Show>Company Details. 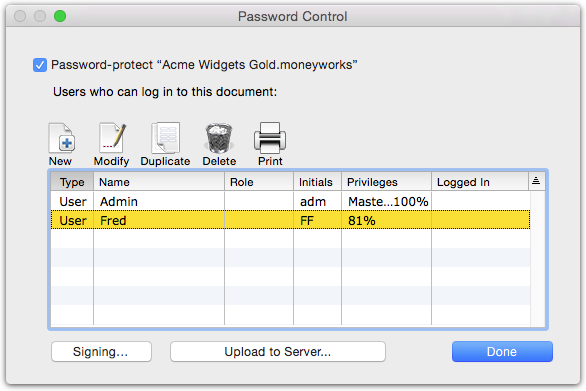 This is the name that will be displayed when you log in to the file on MoneyWorks Now. It is a good idea to make sure that your file has a sensible name. Avoid names like “Backup of backup of XYZ Accounts .moneyworks” (rename the file before opening it for upload). When you upload a file, it along with any custom plug-ins are compressed and uploaded to the selected server. If a file of the same name exists on the server, you will asked if you want to replace it. You should not upload two different documents with the same company name, but if you do, the second one will have the filename appended in your documents list so that you can differentiate them. If you do not want to upload the Custom Plug-ins along with the file (these will replace any existing ones in the targeted directory on the server), ensure that there is no MoneyWorks Custom Plug-ins folder in the same location as the file you are uploading (it is often easier to move the MoneyWorks file to a new, empty directory prior to opening it for upload).